Our 2018 Year in Review offers a summary of LBA’s activities and accomplishments. Here is a glimpse of how LBA's staff efforts elevate your membership benefits through government relations, education and communication. LBA's staff of 10 bring a total of 154 years of association experience—that's an average tenure of 15.4 years each—to partner with LBA members to accomplish LBA's mission—helping banks grow & prosper. LBA acquired Community Cash through our subsidiary, Louisiana Bankers Service Corporation. Community Cash member banks are able to offer their customers free ATM transactions at more than 500 ATM locations in seven states. LBA members posted a total of 60 Classifieds on LBA's website in 2018, generating nearly 21,000 visits to that section on LBA's website. Since 2001, LBA has awarded 360 LBA Service Awards—awards that represent more than 16,000 years of service to the banking industry. LBA Service Awards are presented to bankers who have 45 years or more of active banking service in Louisiana banks. where LBA member banks are able to post and access loan participation opportunities. Act 434 by Rep. Thomas Carmody which protects vulnerable adult individuals from financial exploitation. Act 154 by Sen. Francis Thompson & Rep. Gene Reynolds which improves financial literacy education in Louisiana’s public high schools. Act 202 by Rep. Katrina Jackson which mandates all Parish Clerks of Court participate in the Louisiana Clerks Remote Access Authority central portal by July 2020. During the 2018 state legislative sessions, 2,539 bills & resolutions were reviewed by LBA & 100% of the bills that were identified by LBA as harmful to banks and their customers were either favorably amended or defeated during the state legislative process. LBA State PAC 2018 contributions totaled $92,015 from 76 banks. LBA Fed PAC 2018 contributions totaled $76,500 from 660 individuals. We had 33 members of Cliff's Club for 2018, which recognizes institutions whose employees and directors collectively give $1,000 or more to the Fed PAC. LBA member banks and bankers have contributed close to $1.2 million to the LBA PACs since 2011. LBA is the leading provider of high-quality, cost-effective professional development training for Louisiana banks. Our education opportunities provide an invaluable opportunity to network with peers and stay current on important issues affecting our rapidly changing industry. For 61 years, the Louisiana Bankers Education Council has accomplished its mission of facilitating banker development and promoting financial literacy outreach to Louisiana bankers through their various programs, including the Bank-at-School program, Simply Banking study guides, College Freshman Scholarships, 365 to Rich Bank Shadow Day, Leadership School, partnering with Louisiana JumpStart Coalition and managing the Louisiana Bankers Patrick Spencer/FISC Education Foundation which funds the above programs. 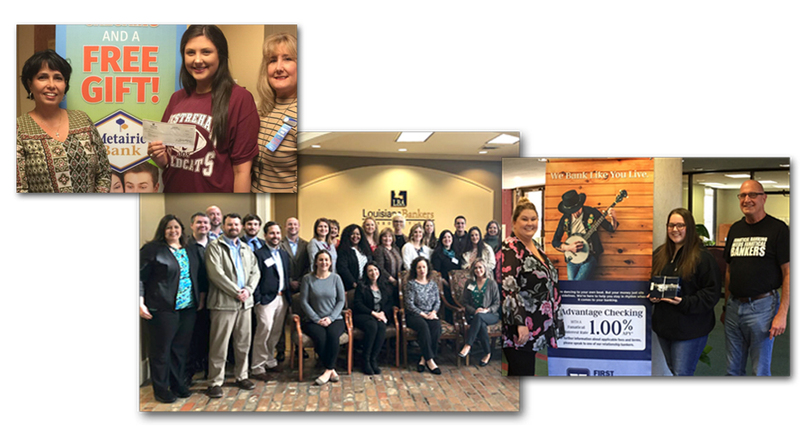 Eight LBA member banks hosted 106 high school seniors in 2018 as part of the 3rd Annual 365 to Rich Bank Shadow Day. That brings total participation since the program began in 2016 to 308 high school seniors. The LBA Bank Counsel Section consists of bank attorneys that work as both in-house and outside counsel. The section members, under the direction of the Bank Counsel Committee members, assist in drafting legislation and work closely with the LBA government relations and legal staff throughout the year. LBA Endorsed Products and Associate Members provide banks with superior products and services. Our partners are industry leaders who share our high standard for quality service. Through LBA Communications, we keep bankers informed, delivering critical industry information to members about legislative and regulatory changes as well as conferences, programs and products and services that are available to our members. On average, each month 3,400 visitors together made about 8,000 visits to our website, viewing more than 33,000 pages as they browsed. We have more than 9,800 registered website users and our most popular pages continue to be the Education Calendar, Classifieds, Peer Group Pages, Press Releases & Photo Gallery, The Louisiana Banker newsletter and The Bankers Directory. The LBA regularly posts resources covering topics like financial literacy, identity theft and emergency preparedness on Facebook, Twitter and LinkedIn that can be re-posted or re-tweeted on our members’ social media outlets to benefit their customers.